Do people really still care about the Oscars? Are they really choosing the ‘best’? How can we know? And who are ‘they’ anyway? I’ll be totally honest up front – I’m not that much of a film buff. Sure, I like films. But I’ve always been more of a book and TV series person. I go to the cinema maybe once a year and rarely pay attention to the latest films. When they’ve been out for a while, then maybe I’ll watch them, but otherwise I don’t feel the need to queue up for the latest Star Wars or see Les Mis on opening weekend. That isn’t a judgement on those that do, I should point out, it’s purely a personal preference. This does mean that watching any awards shows pertaining to film, such as the Oscars or the BAFTAs, would never really interest me. I wouldn’t know what was going on, I wouldn’t have a horse in the race and I can think of more interesting ways to spend an evening. Again, personal preference. What I can’t understand is why those who genuinely do love films and really do have favourites and want to watch a contest between heavyweights winning properly big awards would still watch the Oscars. If that is what you want, the Oscars surely isn’t that anymore? It’s like people who like music and want to see a load of singers perform to see who is the best that year watching Eurovision – you realise that isn’t the basis of the contest, right? Of course, Eurovision has long been seen, even by its most dedicated supporters, as just a big load of fun, a political and televisual pride parade. There may be some groaning and whingeing that the truly best performers aren’t being properly recognised, some may even feign ignorance as to why this could even happen. But they all know that Greece has only voted for Austria because German finance ministers have crushed their economy and they want to spite them in some way – and Eurovision is their democratic outlet. It’s completely transparent – we all know what’s going on, and so being upset that some Estonian metal/grunge band are higher than a Spanish singer who can actually hold a tune would be patently absurd. But with the Oscars, they still try to pretend that it’s all about being the best. ‘Best Actor/Actress’, ‘Best Film’, ‘Best Soundtrack’. Have we not already realised that it’s nothing of the sort? It’s purely a night for political propaganda, virtue signalling, pointing out institutional racism, sexism and the like, and maybe making a first pitch to be President. I’m not even saying this is a bad thing, but that’s what it is. Fine if that’s what you want, but is it not just tedious now? How can you sit through it? It used to be seen as bad form – now, if you don’t stand up to the latest oppression craze, you’re done for. Being much more into sport, watching competition is still exciting. Yes some teams have more money, some teams have better players, there’s plenty of unfairness, but the unfairness is there for all to see. But, take football – it’s still 11vs11 (men, natch) on a pitch and whoever scores the most goals wins. Simple as that. We all know the rules, we can all see the difference in talent between the two teams, and off we go. As far as the sporting competition goes (forget the finance and the boardrooms), as long as we can be sure that nobody is cheating and there’s no match fixing, it’s transparent. Who decides what the best film is? Based on what criteria? Can we trust them to be impartial? How? Apparently they are 91% male and 76% white. Already Hadley Freeman in the Guardian is talking about something that sounds to me like ‘not picking what you think is the best’. Important films? Not the best films? It all looks to me like a census taking exercise. The awards given should reflect society in general – even splits between male and female winners, an appropriate slice of winners who are black, latino, any other race you want to include exactly according to their population split. Again, fine, if that’s what you want. But will you be able to really trust that the ‘best actor’ or ‘best film’ has been chosen? And does it even really matter, with it being so apparently subjective anyway? Arguably, the fact that this doesn’t naturally happen anyway would suggest that there is intrinsic bias, but with a process so shrouded in mystery and so subjective, how do you correct that without rankling one tribe or another? We’ve probably never had awards that have genuinely been given to the best. I’m more than willing to concede that the apparent whiteness or maleness of the history of the awards probably points to exclusion of some sort or another. I get that, and I can completely sympathise with the view that it looks very much like an old guard carrying on with the status quo. But doesn’t that just drive home the point? It will never, and can never be fair if it is subjective. If we’re saying that in the past, people have just been chosen because they’re white and male, then it’s never been fair? There are suggestions that unless the Oscars moves into line with this sort of thinking, it will die. That may very well be true. But in getting there, it may kill itself anyway. I’ve always tried to stay away from identity politics as a matter of principle. It’s so much more interesting to hear what people think and why they think it than base it all on their skin colour or their chromosomes. But this seems to be an increasingly naive view. As someone who wouldn’t care less if the whole Academy, or Houses of Parliament, or boardrooms were completely full of black, M-F trans disabled immigrants, as long as they have a diverse range of viewpoints, I seem to be in the minority. What that does mean is that as soon as we start agitating for equality of outcome, I get bored and give up watching. I can’t trust the outcome, so who cares? I know what my favourite film is, why do I need that validated by a load of over-remunerated victims of one sort or the other banging on about the plight of their favourite thing that week? I’d have no problem making 100% of the decision makers black women. Let them all choose the best film. Not a white guy in sight, if that’s what you want. It’s subjective anyway, they can pick whatever film they like. 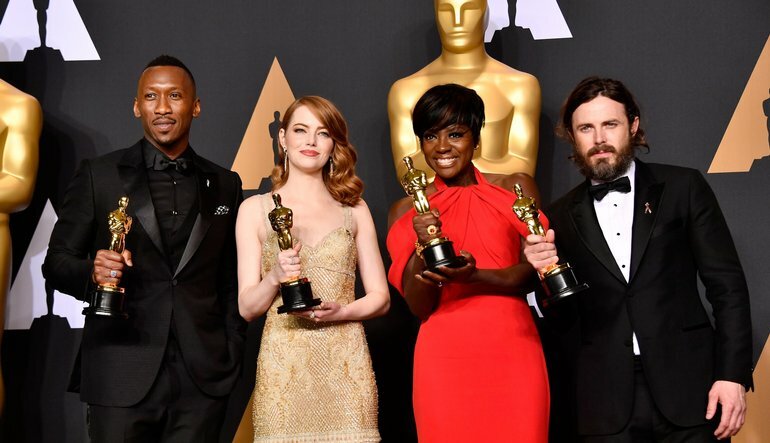 A system like the one that chooses the Oscar winners, so visible and so powerful can never survive a collision with identity politics. The two are currently powerful, and only one can remain standing. I know which one my money’s on. There can never be a system that everyone would be happy with. It would be great if there were a system to be able to choose who or what was genuinely the best, but I don’t know of one. Perhaps you would be kind enough to point one out – I’ll gladly listen. Maybe it would produce a whole roster of white winners one year, or all black winners, or all female winners, or all male winners. But applying quotas, whilst giving the diversity that is desired, would always leave questions to be asked. Last weekend, Manchester City beat Arsenal to win the English Football League Cup. Cool. Nobody can argue with it. City are richer and have better players, but they played on the same pitch with the same referee with the same rules. They won the trophy and nobody whinged. Maybe my simple mind needs these simple rules. But why anyone can still be bothered with film award shows is beyond me. Least of all getting upset about the outcomes. I just can’t see how you could enjoy yourself when you’re just ticking off diversity sheets and not being interested in the actual art. It seems a pointless waste of everyone’s time and effort when you’ll all just end up at each other’s throats anyway. Just assign the awards based on population splits and be done with it. That way, it’ll be transparent and we can all get on with our lives. Let that be the criteria from the start, and let’s drop this facade that we’re choosing the ‘best’. If black people have already won three awards, then no black person can win the next one – it has to be a latino. Would that not make it simpler and fairer? Or see which actor can score the most baskets from the free throw line and give them the little golden statue. If it helps, I can all but guarantee you more black winners if you do. Author Mark WilliamsPosted on March 2, 2018 March 2, 2018 Categories Film, Lifestyle, PoliticsTags awards, baftas, Film, guardian, oprah, oscars, president, racism, sexism, whiteLeave a comment on Do people really still care about the Oscars?